Line Numbers let your error handler pinpoint the exact line where a crash occurs with the ERL function. This lets you fix problems quicker and often eliminates the need for reproducible cases or end-user explanations. Save space. Eliminate comments, blank lines, and indentations. 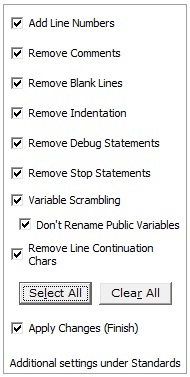 Eliminate debugging code like Debug and Stop statements. You can also remove line continuation characters ( _) and combine multiple split lines into one long one. Rename variables to meaningless names, so recipients of your code are less able to understand and modify your work. Do Until Right(strDir, 1) = "\"
' Minimize the database window.
' but the first. You can't hide the field with the focus.
' Open the table of Switchboard Items, and find the first item for this Switchboard Page. strSQL = "SELECT * FROM [Switchboard Items]"
strSQL = strSQL & " WHERE [ItemNumber] > 0"
' display a message. Otherwise, fill the page with the items. Me! [OptionLabel1].Caption = "There are no items"
' If the action was cancelled by the user for some reason, don't display an error message. 120  Do Until Right(V19, 1) = "\"
180  Me.Filter = "[ItemNumber] = 0 AND [Argument] = 'Default' "
430  V20 = "SELECT * FROM [Switchboard Items]"
440  V20 = V20 & " WHERE [ItemNumber] > 0"
450  V20 = V20 & " ORDER BY [ItemNumber];"
480  Me! [OptionLabel1].Caption = "There are no items"
700  MsgBox "There was an error reading the Switchboard Items table." 890  If (Err <> 0) Then MsgBox "Command not available." 910  Me.Filter = "[ItemNumber] = 0 AND [Argument] = 'Default' "
Supports Office/Access 2016, 2013, 2010, 2007, 2003, 2002, 2000, and Visual Basic 6.0! "Total Visual CodeTools is by far my favorite third-party product."